Playa Flamenca Beach - Fabulous picture of the very popular beach at Playa Flamenca, located on the Orihuela Costa, Costa Blanca, Spain. As you would guess this picture was taken outside the busy summer season and this beach does get a little more packed during July and August. 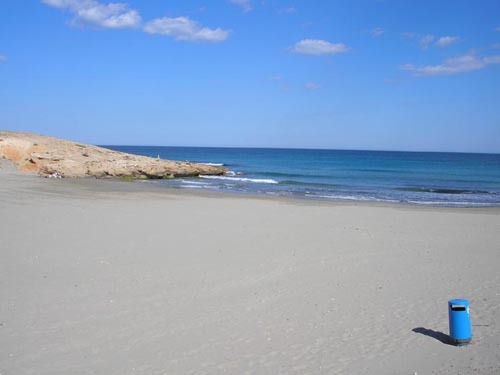 This fine Playa Flamenca beach has 'Blue Flag' status for cleanliness and safety and is gently shelving an ideal for families. The beach is within easy walking distance of most of the local urbanizations and also from the Flamenca beach commercial centre. The busy Saturday market at Playa Flamenca is held on the other side of the N-332 coastal road.